(Apsara dance) will be arranged, during the tour in Siem Reap only. See Land Arrangement Rates here! Upon arrival at Siem Reap airport by 5J 257 @ 1845:2130, welcome by our friendly guide and transfer to directly to hotel for check in. Overnight at Hotel in Siem Reap. Continued your visit to Ta Prohm & Angkor Wat Temples. Late afternoon view Sunset from Phnom Bakheng. Drive back to hotel for your refreshment. Dinner with Cambodian Traditional Dance show (Apsara Dance) at Local restaurant. After dinner, you will transfer to experience night light activities at Pub Street areas (surrounding Old market) where you can find many entertainments such as Bar, Restaurants, Massage shops, night market also very closed to this area. Note: Please note that our guide and driver just drop you off to the Pub Street areas and on the return, you can find Moto Roeumork rides well known as TUK TUK in Thai, back to hotel and pay your own account. Overnight at Hotel in Siem Reap. Breakfast at hotel; 8:00: Continued your visit to the Angkor Silk Farm at Pouk and then transfer to Siem Reap town, visit the workshops of Artisans D’Angkor (wood and stone carving). Lunch at local restaurant. Afternoon, check out from hotel; visit to Tonle Sap Lake by boat cruise visit the floating village. Drive back to Siem Reap Town and shopping at old Market. Dinner at local restaurant and then transfer to airport for your departure flight to MNL by 5J 258 @ 2230:0210+1. –-– One dinner with Cambodian traditional dance show (Apsara dance) will be arranged, during the tour in Siem Reap only. - All Int’l and domestic airport taxes. - Personal expenses such as internet, telephone calls, fax, laundry, beverages, which are not indicated in the program. - Excess baggage charges (porters). - Tips to guides and drivers. - Other optional tours and meals are not specified in the itinerary. As for our above tour itinerary, we can also arrange additional customized trips for you if it doesn’t match your expectations. And of course, the package price will be revised accordingly it’s depend on the values of different services. As for all hotels accommodation, please let me know if you do not preferred to the above recommended hotels, then I can also arrange with the other different hotels as you suggested. Upon arrival at Siem Reap airport by 5J 257 @ 1845:2130, welcome by our friendly guide and transfer directly to hotel for check in. Overnight at Hotel in Siem Reap. Afternoon, check out from hotel; started for your shopping. Dinner at local restaurant and then transfer to airport for your departure flight to MNL by 5J 258 @ 2230:02:10+1. Pick up from your hotel, transfer to visit Tonle Sap Lake. The tour includes boat trip to visit floating Village of Chong Khneas, Gecko Center, Crocodile & fish farms on the Tonle Sap Lake, and then back to Siem Reap town visit old market for shopping. Return to hotel. Morning: Pick up from your hotel, transfer to visit Tonle Sap Lake. The tour includes boat trip to visit floating Village of Chong Khneas, Gecko Center, Crocodile & fish farms on the Tonle Sap Lake, and then back to Siem Reap town, visit old market and continuing your visit to "Les Artisans D'Angkor-Chantiers Ecoles" with the works of wood carving & stone carving. Afternoon: visit Artisans D'Angkor in Pouk at National silk center which is 15Km from Siem Reap town. Over there, you will discover the processes involved in Silk Production of Cambodia and then continued to visit Angkor National Museum is your grand entrance to a world heritage that reveals the glory of the great Angkor Civilization. 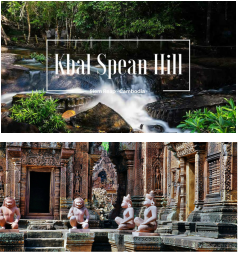 Visit to Banteay Srei temple first and continued to Kbal Spean (River of 1000 Linga), located 50Km from Siem Reap provincial town. This holy place must have been favored during the great Angkorean epoch when it waters, after having washed gods and lingas. Continued on the wonderous royal city with its growing monumental temples. It is located at the foot of mountain. Along the stream of Siem Reap, there are a lot of figures of Yoni and Linga spreading out at its bottom. Note: Please be noted that, when you are arrived to the foot of mountain, you all need to walk (trekking) through the jungle at 1700 meters up and will take approximately 45 minutes to reach to the destination (River of 1000 Linga). Pick you up from hotel in the morning and transfer to visit Phnom Kulen (Kulen mountain), about 48km from Siem Reap provincial town, originally called Mount Mahendraparvata, is the holy mountain. It is widely regarded as the birth-place of the ancient Khmer Empire. This hill top site has the beautiful living waterfall as seen in right hand side picture as well as the country's largest reclining Buddha and it was here, in 802A.D. that King Jayavarman II proclaimed independence from 'Cheva' (probably a reference to the Chams). You will have a picnic Lunch there. Back to Siem Reap on the way visit Banteay Srei and late afternoon view sunset from Phnom Bakheng Hill. Return to your hotel.